GUEST BLOG by Dawn Kotowicz of the Coastal Resources Center/ Rhode Island Sea Grant at The University of Rhode Island Graduate School of Oceanography. On October 3, the Coastal Resources Center (CRC) hosted a workshop at the Graduate School of Oceanography campus of the University of Rhode Island about scup to share findings of a recent Rhode Island Sea Grant-funded project to better understand markets for scup in Rhode Island, specifically, how the fish move through local markets, and of the demand and current supply of seafood among local diverse urban populations. Attendees were treated to a lunch of scup with salsa, rice and veggies, and asked to contribute throughout the workshop. Fisheries management has dictated how data surrounding fish catches and landings are collected. This means that data are collected with respect to how the species contribute to their marine ecosystem and the value of them to fishermen and as a commodity. However, recent attention to sourcing more food from local ecosystems for a variety of reasons has drawn attention to how fish contribute to local food systems, for which there is almost no regularly collected data. Therefore, with scup as an example species, my collaborators and I were funded to find out where fish currently go after they are landed in Rhode Island, and to understand how and why decisions are made about which market channels these fish follow. Specifically, we wanted to learn where scup is currently being sold locally, which it is currently being consumed or bought by consumers, and where there may be demand that is not being met. 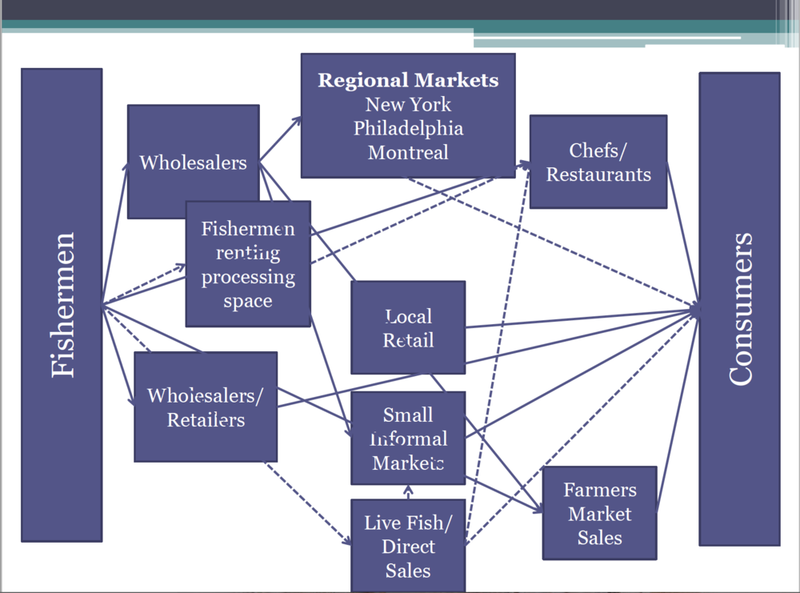 Through interviews with members representing different parts of the market chains through which scup travels, along with observation at various wholesale and retail outlets, we described the system as a whole, and significant factors that determined decisions throughout. The second aspect of this work was to survey customers at the Armory Park Farmers Market in Providence which serves a diverse urban population, including many recent immigrants to the U.S. Surveys were designed to learn about their seafood consumption and purchasing habits, and to understand if currently, their access to seafood meets their needs. Specifically, we wanted to understand if there was demand for a type of fish, like scup, that was underutilized, caught locally, and inexpensive. Most survey respondents reported that they like to eat seafood and would purchase seafood at a farmers market if it were available, though there is currently no seafood vendor at the Armory Farmers Market. Additionally, of those surveyed who had not been born in the U. S., all of them preferred whole fish over fileted. Since scup is a small fish, that is easily eaten whole and somewhat cumbersome to filet, these findings suggest that a fish like scup could be a good product to offer at farmers markets where immigrant populations buy their food. Our workshop brought together fishermen, representatives from the fishing community, potential buyers of underutilized species, and leaders from diverse urban communities to contribute their knowledge to our findings. Many of the attendees had been involved with their own research on scup and they were encouraged to provide input from the research they had conducted. Most importantly, we hoped to identify ways in which we could begin to connect local supply of an underutilized species like scup with an unmet demand for local seafood. There was significant interest from all attendees in allowing direct sales from fishermen to consumers, and to address the regulatory barriers that currently prevent it. Attendees pointed to farmers, whose regulations on selling directly to consumers are less burdensome, as a way for regulatory agencies to move toward allowing fishermen to sell directly. Our next steps are to put together the comments from the workshop and attempt to move forward with some of the suggestions on how to get more local seafood to more local consumers, throughout New England.